Fletcher European Containers manufacture a range of plastic storage lockers that are hygienic, tough and durable, incredibly secure and resistant to denting, breaking, vandalism and extreme weather conditions. Our Supertuff range of plastic lockers includes 3 different inter-stackable sizes that can stack and provide an ideal storage solution for workplaces, offices, schools, gyms and swimming pools. 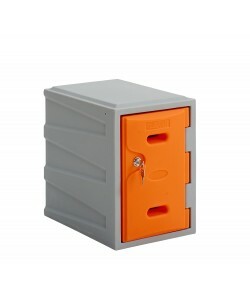 Tested and certified to the BS EN 16121:2013 standard for stability, safety, strength and durability, our plastic lockers prove to be the perfect choice for both indoor and outdoor storage. 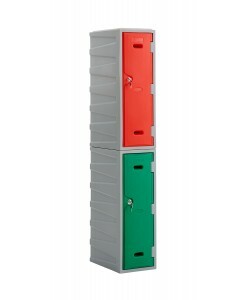 Produced in our UK factory the Supertuff plastic lockers are rotationally moulded from virgin polyethylene material. The stress free manufacturing process ensures that the plastic lockers are incredibly robust, capable of withstanding harsh conditions and high impact blows. The plastic locker incorporates an anti-theft dual locking mechanism that keeps its contents safe and secure and helps to prevents vandalism. An ideal range of plastic storage lockers for almost any environment the Supertuff plastic lockers can be supplied in a huge range of different colour options. 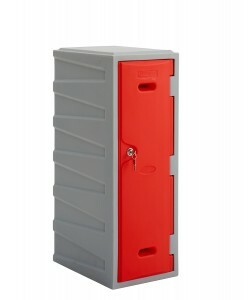 Enabling you to customise the plastic locker we also provide a variety of different lock options, sloping tops, labelling and number plating and plastic locker stands to suit. 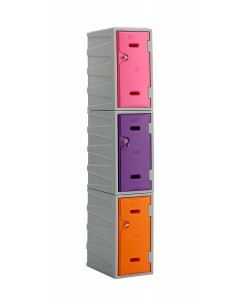 The Supertuff range of plastic lockers includes 3 different sized lockers that all incorporate an identical stacking feature enabling them to inter-stack. Designed to help you maximise your available space the different models can be stacked on top of each other in any configuration required. Standard configurations include the plastic lockers being stacked up to an overall height of 1800mm, involving stacks of 4 x LK01 lockers, 3 x LK02 plastic lockers or 2 x LK03 lockers. A popular choice for the education sector the Supertuff plastic lockers prove to be ideal storage where space is at a premium. The LK01 lockers are perfect for infant or primary schools, offering an adequate storage space for young children as well as being able to be stored in the tightest of spaces. Ideal for secondary schools, colleges and universities the LK02 and LK03 plastic school lockers offer larger storage capacities. The design of the plastic lockers includes two ventilation points on the door to prevent smells from building up within the plastic locker, however the holes are narrow, helping to prevent any objects from being forced through them. 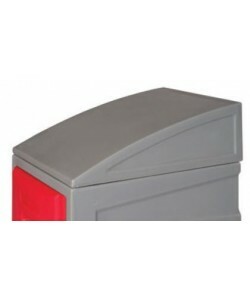 Sloping tops and metal stands can be supplied for any of the sizes of plastic locker, allowing you to lift the lockers up off of the floor and help to prevent the build-up of litter on top of them. Completely constructed from plastic the Supertuff range of lockers prove to be incredibly hygienic and can be easily cleaned. Without fear of rust or corrosion the plastic storage lockers can be hosed down within high care environments or changing rooms, making cleaning a quick and easy task. The food grade polyethylene material is incredibly durable and is resistant to scratching or denting. The plastic can also be easily wiped down and helps to prevent any vandalism or graffiti. 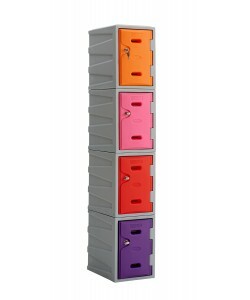 Perfect for use as workplace lockers, the lockers can be supplied with sloping tops if required to help prevent any build-up of waste or dust on top of them. 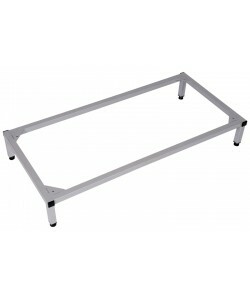 Adjustable locker stands can also be supplied to raise the lockers up off of the floor. The Supertuff plastic locker is not only incredibly strong and durable, harnessing a nigh unbreakable construction, it also incorporates a sophisticated dual locking mechanism. 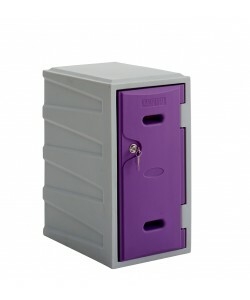 Designed to prevent theft and vandalism the secure plastic lockers can be safely secured indoors as well as outdoors. Alternative lock options can be supplied including swivel catch locks that can be secured with a padlock and coin return locks. Our plastic lockers are used widely throughout many industries including food manufacturing, hospitality and catering, pharmaceuticals and healthcare, leisure and tourism, education and many others. Perfect for use as workplace lockers, school lockers, gym lockers, swimming pool lockers, hygiene lockers and much more the Supertuff range of plastic storage lockers is the ideal storage solution.